The golf shop at Mountain Aire is staffed by friendly, helpful, knowledgeable people who want to help you enjoy your golf outing. 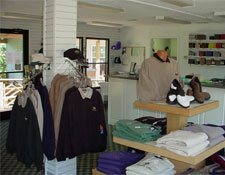 Our shop has a variety of apparel, shoes, logoed merchandise, golf clubs, golf balls, and much more. Let us help you with your selection of merchandise. Mountain Aire is a member of the Carolinas Golf Association.You can join our association for only $20 per year and this will give you membership access to the GHIN Handicap system. Your handicap will be certified by the CGA and will be accepted wherever you go to play. Mountain Aire hosts several tournaments throughout the year. Keep up with them by visiting our website often.